◆ Patterns appear in myriad ways and forms in the system, in which they manifest. The underlying system is important. 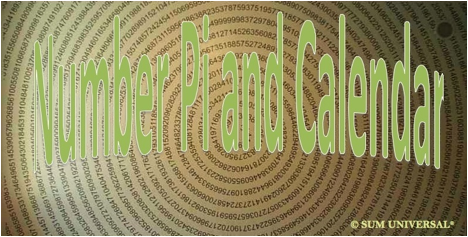 ◆ The pattern of life itself is that of change, which is also conveyed through number Pi (π) and our calendar as well. ◆ Just like π is not an integer and not consistent within itself, so reflects our calendar an inconsistency. Even we humans, dependent on time and space, are inconsistent creatures. Given that every number after the period is part of the whole of π, the digits after number 3 are also of importance, and they start with number 1, 4, and so on. The underlying connection of the calendar is time itself, which is shared by day and night and dependent on the position of the Earth around the sun. Since our world is a dual world, like day and night, we experience life through opposites and/or correlations therefore the pairing of these digits is significant. The first 4 digits after number 3 are 1, 4, 1, 5, (3.1415…). The result of the addition of the first 2 digits is number 14 and/or 5 (1+4=5), and the following is number 15 and/or 6 (1+5=6). According to our calendar a year exists of 365 days. Astronomically that is not correct; the planet earth revolves around the sun a bit longer: 365 days, 5 hours, 48 minutes and somewhat more than 45 seconds. Adding a day every 4 years, the leap day, balances out the difference–but not quite. Adding an additional day to February every 4th year gives February 29 days, which makes sense because the sum of number 14 and 15 results in number 29. Since the leap years reduce the difference, but they cannot completely compensate for the difference, the numbers are not too round. The extra hours, minutes and seconds add up in four years to about 23 hours and 11 minutes–that is not quite a day. For compensating this discrepancy leap seconds are occasionally added. Therefore a common calendar year has 365 days and a leap year 366 days. When adding up all the numbers from the common calendar year, we arrive at number 14 and/or 5 (365 and 3+6+5=14 and 1+4=5). Adding up all the numbers from the leap year, we arrive at number 15 and/or 6 (366 and 3+6+6=15 and 1+5=6). The next connection in π (3.141592…) relevant to our material world is the number 92. Our 92 naturally occurring chemical elements represent this number. Looking at these numbers: 3 14 15 92, I see that they relate to our world and our modern calendar system. While reading some info on number π on the Internet, I found the following on Wikipedia: “Contact is a science fiction novel written by Carl Sagan and published in 1985. In Carl Sagan’s novel Contact, π played a key role in the story. The novel suggested that there was a message buried deep within the digits of π placed there by the creator of the universe.” And the message is not only fictitious, but real–numbers reveal.